Since Rutgers University Chabad House first opened, Jewish students on campus have recognized Chabad House as the one place on campus they can meet, learn, and grow closer together. “I can’t think of any other campus organization that has been as successful as Chabad House to bridge the supposed barriers between fellow Jews,” says Chabad House campus rabbi, Rabbi Boruch Goodman. “We’re determined to keep it that way,” he adds. This determination was recently put to the test. For several years the number of Sephardic students on campus has steadily grown. Before long, Sephardic students began finding their way to Chabad House. And before long, Rabbi Goodman and Rabbi Yosef Carlebach, Executive Director of Rutgers Chabad House, were worrying if their needs were being met. One solution was creating new programs for Sephardic students. Several, including a series of Sephardic Shabbatonim this past year, are bringing Sephardic students into Chabad House with increasing regularity–an indication these efforts are working. Another solution was establishing a permanent minyan for Sephardic students. 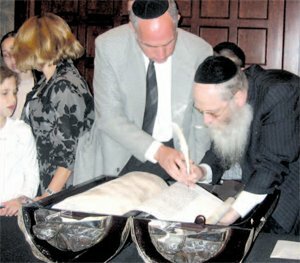 The minyan takes place within a dedicated room for a synagogue, with Sephardic prayer books and a traditional Sephardic Torah. 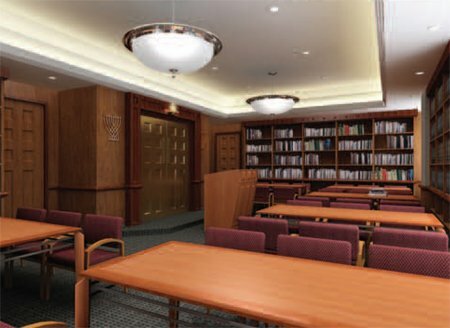 Now, with plans to add 55,000 square feet to the existing Chabad House, Rabbi Carlebach reserved a sizable area in the blueprint for a magnificent, new Sephardic synagogue. The décor in the synagogue will emulate existing Sephardic synagogues in New Jersey and New York. Mr. Harry Franco, Mayor of Deal, New Jersey, and a long-time supporter of Chabad House, is ecstatic about the planned Sephardic synagogue at Chabad House. ”Jeannie Epstein and her husband, Mr. Donald Epstein, are residents of Deal and strong supporters of the Rutgers Chabad House. When told of plans to build a Sephardic Synagogue at the Chabad House, Jeannie expressed amazement and appreciation. “That’s a great thing,” she exclaimed. Despite the large number of Sephardic students at Rutgers, many, she says, miss their connection to customs and traditions while on campus. “The synagogue is good news for Sephardic students at Rutgers; it will encourage many more to attend Rutgers,” she believes. Mayor Franco urges members of his community to visit the Chabad House. “We have to make the entire community more aware of the extraordinary work Chabad is doing for our community’s children,” he said. “While the community is very careful to support our Yeshivot and Shuls, Chabad is equally important. But this sensitivity to the needs of Sephardic students is why the Rutgers Chabad House is so worthy of the Sephardic community’s support. ● Name dedication opportunities specifically related to the Sephardic shul are still available. These include naming the synagogue, dedicating the Sefer Torah, Bima, Heichal, and more. To secure your dedication, please call Rabbi Yosef Carlebach at the Rutgers Chabad House at 732-296-1800.